A great basic Low Carb, low fat recipe, versatile. Makes individual muffins; easily multiply by 6-8 for a loaf or try one large Tablespoon dollop on a greased cookie sheet for a quick biscuit. Add nuts if desired, use vanilla, chocolate or another flavor of protein powder for variety. Cornmeal porridge is a typical main course throughout much of Africa; served with various relishes. Make a bite size ball with your fingers with an indent to scoop a little relish and enjoy! Mama loves this easy bake casserole. It's good enough for company. Mama only eats low carb and loves it. This is an easy versatile low carb recipe. same recipe either baked as a muffin or fried as a pancake topped with cottage cheese and sugar free syrup. A complete breakfast with a cup of coffee. This is the easiest quick dinner, with a piece of protein, it's complete, nourishing, satisfying and perfect for a low carb nutritional lifestyle or insulin resistance individual. Delicious, if you have an icecream maker, you can use that with the liquid. This version is the blender version. 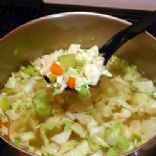 An easy basic crock pot soup. You may add any veggie or spice you choose, or meats finely chopped. Serve with a side dish of fresh bread if you wish.Just don't forget to add the calories. A mix of fall soup veggies (pkg available at many stores) and soup bean mix, with chicken soup starter. An excellent all in one breakfast for those busy mornings. mamaCD loves omelets and simplicity. This recipe can be changed many ways by using different meats and different vegetables according to taste. Simple one minute omelete. Just plain easy, healthy, low carb and versatile as always with mamaCD's recipes. For a fresh new taste (only for those who are at goal and able to eat the higher carbs) Its a refreshing salad, light, yet filling. Use mama's bake mix to make low carb muffins, pancakes, loafs and so much more. Be creative by replacing mushed fruit of any kind for the water. Use fancy silicon muffin moulds-my favourite! For a low fat version replace applesauce or any mushed fruit for the oil and water. Spaghetti squash instead of noodles, mixed with mozzarella cheese and topped with Parmesan Cheese. A true delight for an Italian night. If you like stuffed peppers you'll love this quick easy dinner. Serve as is or top over rice for family. Pinda Sauce is nutritious enhancing the flavour & protein content of your favourite dish. Serve over meat, tofu, veggies, rice or noodles. Or use as a dip with corn chips. Bean Salad, perfect balanced lunch, leave out corn if you wish to lower the carb count. Best for phase 4, maintenance plan, not for weight loss. Delicious High Fibre Carrot Cake with Cream Cheese icing, perfect for taking to potlucks and can be adapted to be low carb. Easy to make, delicious to eat, never be deprived of tea & toast again! MamaCD's Bread is great for breakfast, toasted with some low carb jam. Who can resist tea & toast as a mid-day snack, or perhaps a part of a meal, just make your favourite nutritious and healthy sandwich. Never feel deprived again. Its simple, and adaptable (change fruit, and jello and get a whole new taste). A great dessert for PotLucks. Quick and easy bread recipe, giving you the perfect bun for those upcoming BBQ's, or waffle, pancake or bread for a sandwich. Its all in the spices, shaping and cooking method. Like all of mamaCD's recipes, its quick, easy, nutritious fit for low carbers and the whole family. This brownie version is excellent for the whole family, snacks, special occasions and is low carb. What more could you ask for? Quick coleslaw, stores well in fridge and great with fish which I like on Saturdays, after watching the fishing shows. So Basic, so fast easy and nutritious, simply choose your vegetable(s), type of cheese (or none), spice it up, I like garlic, and the multi-peppercorns ground. Makes for an easy breakfast, topped with cream cheese for delicious, nutritious breakfast on the go. Make and freeze. Great for lunch at work or anytime. Easy, versatile, mix it up, different proteins, different veggies and different salad dressings or toppings as desired..just stay low carb. Easy, delicious and versatile. Pick your favourite low carb vegetables, change the kinds of meats that you use and soup starters. Its a whole new meal every time you make it. And for those members of your family that do not eat low carb, just serve theirs over 1/2 cup cooked rice, pasta, potato, or left over kraft dinner. They will love it also, and not feel deprived nor will you. 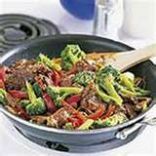 This low carb, nutritious delicious stir fry is highly versatile. I use different meats, different non-starchy vegetables and voila, my basic dinner. Always different, economical-take advantage of today's reduced racks at your local grocery store. Simple, easy, no brainer cookie. Add a little flax meal or soya flour if you wish. Complete Breakfast, excellent for low carb lifestyles. Recipes gathered by mamaCD who has chosen to honor God with a healthy low carb lifestyle. MamaCD has lost nearly 100lbs. Money can buy a lot, but not health, we must all be good stewarts of our bodies that God gave us. Life is a gift, don't waste it, enjoy your gift and live life to its fullest!